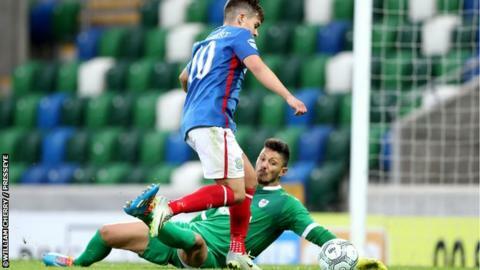 Linfield have inched closer to a tie against Celtic after a dramatic win over San Marino's La Fiorita in the first leg of their Champions League first-round qualifier. Jordan Stewart came off the bench to score the winner on his Blues debut. Aaron Burns also had a penalty saved by La Fiorita keeper Gianluca Vivan, who repeatedly frustrated the home side. Stewart's 89th-minute strike gives Linfield a slender advantage ahead of the return leg on Tuesday. The build-up to the game had been overshadowed by the possibility of a second-round tie against Celtic but Linfield boss David Healy insisted they had to respect the challenge of the San Marino champions. The hosts dominated from the kick-off at Windsor Park but found it difficult to beat Vivan as Niall Quinn, Mark Stafford and Stephen Lowry all went close to scoring in the first half. Stewart, a former youth team player with the Blues, was one of three new signings made by Healy in the off-season and his introduction in the 60th minute had an immediate effect. Moments later, Linfield were awarded a penalty when Vivan was booked for a high challenge on Lowry as he competed for a cross. But the goalkeeper spared his own blushes as he dived to his right to save Burns' effort. It had looked as though Aaron Burns' missed penalty would prove costly for Linfield. Linfield continued to press forward and their persistence was finally rewarded in the dying minutes when Stewart turned his marker and rounded the goalkeeper to slot home a dramatic winner. The Irish League champions will now travel to San Marino for the second leg on 4 July, with the tie still in the balance. The dates for the second qualifying round games are 11/12 July and 18/19 July. However, if Linfield progress the first leg in Belfast would be moved to 14 July because of security concerns. Match ends, Linfield 1, La Fiorita 0. Second Half ends, Linfield 1, La Fiorita 0. Jordan Stewart (Linfield) is shown the yellow card for a bad foul. Substitution, La Fiorita. Alessandro Guidi replaces Emiliano Olcese. Substitution, La Fiorita. Lorenzo Lunadei replaces Crocefisso Miglietta. Goal! Linfield 1, La Fiorita 0. Jordan Stewart (Linfield) right footed shot from the centre of the box to the centre of the goal. Substitution, La Fiorita. Tommaso Zafferani replaces Adolfo Hirsch. Substitution, Linfield. Cameron Stewart replaces Aaron Burns. Adolfo Hirsch (La Fiorita) is shown the yellow card for a bad foul. Gianluca Vivan (La Fiorita) is shown the yellow card for a bad foul. Substitution, Linfield. Jordan Stewart replaces Niall Quinn. Second Half begins Linfield 0, La Fiorita 0. First Half ends, Linfield 0, La Fiorita 0. Crocefisso Miglietta (La Fiorita) is shown the yellow card for a bad foul.